Examples are good, but some folks are “theory people” and like to hear about the WHY behind a process. I’m a theory person, which actually serves me very well at parties. So let’s talk about the theory behind momentum marketing, why it works. I recently read a book called Launch by Jeff Walker, the original teacher of what he calls the Product Launch Formula. With almost 10 years of experience in marketing, I understood both the WHY and the HOW of the formula immediately and could immediately see 10,000 ways to apply it to any kind of business you might want to market. By the way, Jeff Walker sells personalized coaching services for this launch formula for $2,000. He deserves every penny of his students’ money, and what he does in this high-end coaching program is teach people how to apply the theory of the formula to their particular businesses. What I am doing here is teaching you, a Young Living business owner, how to adapt the four-step process to YOUR business—beginning with heart-centered sharing, which is the first step in marketing Young Living. Sharing, sharing, and more sharing. We YL people share in a variety of ways, and we teach, and we show love and gratitude, and we bring ourselves into our businesses on a personal level. The products are awesome and life-changing, but YOU are the center of your business. Sharing yourself is just as important as sharing lavender, lemon and peppermint. So, how can you share yourself even more effectively? Through Momentum Marketing. You do the same amount of work you’re doing right now only you do it more purposefully, give your community more of the beautiful stuff. If you’re confused about marketing and haven’t gotten started yet or haven’t seen much effect from your efforts, start here, with Momentum Marketing. Rule number one in Young Living marketing is to do stuff on purpose. Know WHY you do what you do. Don’t do stuff just because I tell you to, or your upline, or a marketing guru out there floating on the internet. Do stuff because you know why you’re doing it. Why should I put lavender on a bug bite? Because through the experiences of thousands of people and the research of dozens of science-y people, lavender has been shown to work for bug bites. Should it be just any lavender oil a person can find anywhere? Nope. Young Living lavender. Why? Because Young Living pays exquisite attention to every part of the growing, distillation and bottling process. It’s the best lavender oil that it can possibly be. And why is that? Because a dude named Gary Young cares about what his company produces. He stakes his personal reputation on it. Why does Gary do that? Because he believes essential oils are gifts, from nature, from God, from quantum physics, however you want to define the gift-giver. And gifts should be treated with the utmost respect, and we should share those gifts with everyone who will pause for a moment and listen. Plus, lavender works to ease the pain of bug bites. Do stuff on purpose, and know why you’re doing it. So, Step 1, talk about the why. Why should people pay attention to you? Why should they care about what you have to say? Here’s a bit of homework for you: Think about this WHY. Write down 10 or 20 or 100 reasons why. Dig down deep into the why. When you first start your YL business, you may not know all the whys yet. Talk to your team members, talk to your sponsor, talk to me. Let’s brainstorm whys together until the list fills a whole notebook. Why is a beautiful thing. When you can communicate why to everyone who will listen, in a Facebook post, standing in front of a room teaching a class, talking to your bank teller, everywhere, when you can easily reach into your heart and communicate a why because you’ve internalized the why, you’ve done an incredible thing. You’ve connected with another person’s emotions, on a level way beyond words. Energy and love and sharing why. But people want to know WHAT, too. What do I do for certain health challenges? What works to balance my emotions and my mind? What oil should I use to repel bears? The what is important, and you have answers to that, too. Not necessarily out of your head, and you can’t depend on your head to contain all the answers to what because people need help in an amazing number of ways. The answers to what come out of your reference books, they come out of Young Living product videos and brochures, they come out of asking other members of your team or the entire YL community the what question. I guarantee you Gary Young doesn’t have all the whats in his head either. He has lots of answers after being in this business for a couple of decades, but as a leader, he’s surrounded himself with people who know stuff he doesn’t know, right? As a leader, you also must surround yourself with people who know stuff you don’t know. Books, resources, teachings, learnings, people. Down here in your personal community, your people want to know “what” a lot, so as a leader, tell them what—but don’t stop with that—you can do so much better and supply the WHY and the HOW to your answer, too. 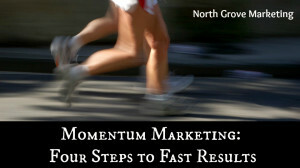 So, let’s talk about HOW, the third step in doing purposeful Momentum Marketing. Crafting a HOW in your marketing can be done with love and grace and focus on the other person’s actual needs. How does a person use an oil or supplement? How does a person get a Premium Starter Kit? How does a person grow a YL business? Tell people how to use the WHAT from step 2, and reinforce that with the WHY from step 1. There’s always a “how” in any question, and if you skip over answering the how, you’re not giving a complete answer, you’re not completely serving the person in front of you. How leads easily and gracefully into asking for something, which is step 4 in the Momentum Marketing method. In marketing terms this is called a “call to action” or a CTA. This is where most folks in Young Living slam on the brakes and say, either out loud or in their heads, I shouldn’t ask for anything because that’s sales, that’s pushy and it feels icky. We beat around the bush and hem and haw and the other person senses our bad energy around asking for something and goes ahead and just says NO, to relieve you of your energetic discomfort. Yep, I believe that people often say NO because they sense you’re uncomfortable with asking for anything. They feel that you don’t want to put them out, or that you don’t trust your own WHY or believe your own WHAT or HOW, so they come up with unanswerable objections like “I don’t have the money” or “I don’t have the time” when you ask them to take action. Maybe they don’t have the money or the time, it could be true, but most likely it’s because your energy around asking for action is a little hazy or a lot hazy. So here’s another bit of homework for you to work through with yourself or with your team or with me, if you ask me for help around this challenge. I can help you work through this challenge, by the way, that’s why I’m here. Write down 10 or 20 or 100 reasons WHY someone should take an action when you ask them to. WHY should someone like your Facebook page? Why should someone put oils on their feet as opposed to another body part? Why should a person join your Young Living team? Why should a person use oils at all? Keep going back to the why and it makes that “call to action” so easy, so easy. Then, when you reach step four in the Momentum Marketing process, asking for action—any kind of action, any level of commitment, any amount of buy-in from the person who’s listening to you, the asking for action is purposeful and logical and connected. From one heart to another. Of course you want people to do stuff, right? It’s obvious and done with love. That’s the theory of Momentum Marketing in a nutshell. Theory is good to understand. So, why should you use Momentum Marketing in all your YL marketing efforts, from social media to in-person classes to events to blogging to talking to the bank teller? Because it works. It shows your love and your ease, and it communicates your personal WHYs to other people. What is Momentum Marketing? It’s a four-step process that allows you to do stuff on purpose without causing you a bunch of extra work. In fact, following the process makes everything easier, and saves your time and your sanity. How do you learn more about Momentum Marketing and its applications in your actual, real life YL business, no matter if you do this part-time or full-time or you’re simply sharing the oils and not building a business? I’ll teach you that, if you’re interested in knowing more. I took the Momentum Marketing method apart and put it back together and wrote a course just for you as a Young Living person. It’s a three-part course that demonstrates how to use Momentum for little things, mini-momentum, specifically promoting the monthly free products. If you take the script I wrote to go along with the class and you copy it exactly, you’ll help your community see the value (WHY) in ordering 300 PV each month, WHAT to say that helps them understand the WHY, and HOW to bring their PVs up to get the very best in health and wellness. The script also gives you a gentle call-to-action to help your people easily and gracefully plan their orders to meet the 300 PV goal. If that’s the only thing you take from my Momentum Marketing course and apply to your business, can you even imagine what that would do to grow your community? If you want to reach ranks in YL, this one thing will help you immensely. Part 2 of the course teaches you about medium-momentum, specifically care calls. Care calls are hard, right? Not necessarily hard for you, because you can do care calls all day long because you actually care about following up with new people and people who have been in your community for a while, right? Getting people to answer the phone or respond to a care email or Facebook message is the hard part. So frustrating when people won’t respond. I teach you how to use WHY WHAT HOW and asking for action to help people understand why communication is important. This Momentum Marketing thing really, really works for that, for following up. Part 3 of the course teaches about maximum-momentum, which is a really really big thing you might do in your business. I use the specific example of “trying on a product or protocol”. Trying on products and protocols takes many days or weeks to see results, so in maximum momentum you use that time wisely to bring attention and excitement to what you’re doing as a YL product user, to what your team or community is doing together. Lots of folks do this haphazardly (I did the petrochemical cleanse and here’s my before and after picture! Woo-hoo! So now what?) but it can be done purposefully and completely and fully and your community will understand why it’s important, what to do, how to do it, and they’ll be more willing to do it themselves (the call to action). I could go on and on about how to use the Momentum Method in so many ways, but I believe you’re a smart person who just needs to be shown the process and given the opportunity to ask questions and get help applying it to how you do business. So, go to Seminars in the menu above and drop down to “Momentum Marketing” and purchase the course. It’s self-paced, so you have time to work on it at your own convenience. Each part of the class takes less than 20 minutes to learn about and the scripts and checklists can be referred to as needed in the future when you apply what you learn. I also believe you have the money to pay for this course. Before you hit the Buy Now PayPal button, take a few moments, take a few deep breaths and ask yourself what would happen if you could do marketing more purposefully? What would happen if your messages came across to your community on a heart-centered level? What would happen if people could really know WHY, if they could really understand WHAT, if they could really apply HOW, and if they actually did what you asked them to do? Would that bring your people more wellness and happiness? Would that bring you yourself more satisfaction in serving? I think it would. So buy the course, work through it at your own pace, and report back to the open Facebook group or email me. Complete instructions are included with the course. I’m so excited to share the Momentum Marketing method with you! C’mon, let’s do this together! Today I’ll teach you how to use the four-step momentum marketing system in a very practical way: launching a video using social media (like a Facebook group or page) or your email list or your blog or whatever method you use to communicate with your community. This training falls under the “medium momentum” category. There’s mini-momentum, in which you might apply all four steps in one announcement or in one day, and you ask for something easy. Then there’s medium momentum, in which you apply the four steps over a series of days in several communications, and your community’s participation is bigger but still really easy. Then there’s maximum momentum, in which you apply the four-step process over an even longer period of time and build up tons of anticipation and enthusiasm for a really big thing and your community can’t WAIT for it to happen. See, depending on what you’re launching, you use the system in different ways to accomplish the goal of asking people to take action. Remember, tell them why, tell them what, tell them how, then ask for an action. Taking all four steps brings people deeper into your community, puts them in the same space as you, it’s friendly and shows kindness, and you use the sharing process to the max even if you’re sharing a small thing. And it is so easy to duplicate no matter your skill level, completely independent of technological skills, product knowledge, the size of your downline, or almost any other reason you can think of to not implement the four steps in your marketing. You can do this, and you can teach this to your team. Let’s jump right into how this applies to an actual real-life example. Download the script How to Promote a Training Using Facebook by looking at this page. This formula, like I said can be applied to just about anything, but seeing it laid out in this example and the other examples I’ll show you later helps it all make sense. So you formulate a plan to make a video. You may have made dozens of videos before, or this may be your first one. Doesn’t matter. Let’s say you want to make a video about the Premium Starter Kit, because that’s a great place to start sharing essential oils with new people. Step One in the momentum marketing formula is to get at the “why” of why this video should be interesting to someone. You can easily get at the “why” by asking questions in your community. In this example, I’ll use a Facebook group or page as the communication method with your community, but like I said you can use any communication method and just modify the process a bit. “Why” involves emotions and transformation. Go to your Facebook group and ask two to four questions, spaced out over a couple or three days, allowing time for answers and conversation. I’ve put some suggested questions in the script, and you should use your own words. You’re asking for help and engaging your community in creating the Premium Starter Kit video, getting them excited and allowing them to help. Just remember: Why involves emotions and transformation. Now, let’s approach the “what”. This develops the information part, the thinking part, as opposed to the feeling part. What should people know about the Premium Starter Kit? And, more importantly, what should people know in addition to the products? Ask your community! I made some suggestions in the script, but the group mind can brainstorm far better than a single mind. Engage your community (and don’t forget to say thank you) and they will be much more likely to watch the end result themselves and share it with others, spreading the Young Living message. Remember, what involves thinking and information. Step three is “how”, building anticipation for the moment you release your video. Spread two to four posts over a day or two as I’ve suggested in the script, using your own words and being responsive to your community. By now, conversation should be easy with a little prompting to keep interest levels high. You’re aiming for enthusiasm here, so stay on top of your posting and responses so you don’t lose momentum. The key point to remember is the how stage builds anticipation. Then you get to the big day: Your video about the Premium Starter Kit, using the feeling and thinking (why and what) suggestions supplied by your community in steps one and two, is finished, edited and ready for release. So, go ahead and release it! Ask your community to view it and give you feedback and share, share, share. The whole process could take a week or ten days, but the actual time you spend gaining momentum could be a total of 20 minutes spread out over that time period. Those minutes are incredibly well spent because you’ve built a better relationship with your community, showed you care and value your people, and gotten them excited to see what you’ll do next. That’s completely priceless. Four steps. Do you think you could do that? Do you think you could apply it to other situations? Do you think the business-builders in your organization could do it? A little practice makes the process flow more smoothly until it becomes second nature. It’s all about sharing and giving value and showing love to your people. I’ve been brainstorming up a storm on this momentum marketing idea. I have pinpointed several topics based on suggestions I’ve gotten so far from my community, and I’m putting together a short, learn-at-your-own-pace training series based on those suggestions. But now that you’ve read this article and watched how the process unfolds, how do you think it could be applied in a Young Living business? What other launches could you do, using this four-step process? 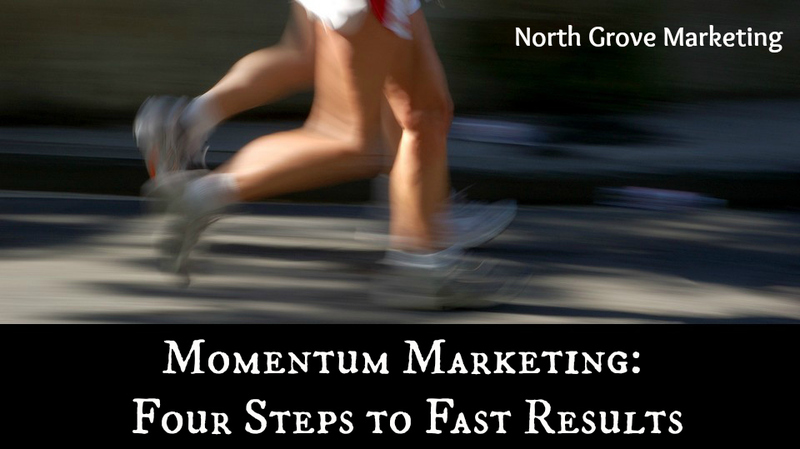 Why would it be important to use a process to help you plan and gain momentum? You’ve seen Vicki Opfer’s Heart-Centered Sharing training, right? If it’s been more than a week since you’ve read it, go into your back office when you’re finished with this article and read it again. Vicki’s sharing model is Young Living’s sharing model, and I’d like to show you how to add significant momentum to your everyday efforts. Heart-Centered Sharing allows us to empower as many people as possible to take care of themselves and their families, using natural products, so they can live longer, healthier and happier lives. Share with an open and loving heart. Be a good listener and truly be of service to others. Teach your friends and family about the Young Living lifestyle and how to share it with others. This creates duplication (people sharing with people, sharing with people), which will ripple out into our world in new and fascinating ways. Vicki’s heart-centered sharing method is awesome. If you get enough people and their friends together in a room often enough and follow her step-by-step instructions, you will, over time, build your team up to Royal Crown Diamond. Her method deals with the moment of enrollment, obviously the most critical juncture in team building. But I wonder about some things, based on my husband’s experiences and the experiences of folks in the Young Living communities I hang around in. I wonder what happens after enrollment. You’ve got a few people in your direct downline, and some months they order products and some months they don’t. Are you still helping those people to live a healthier, happier life? Some of your folks might be scattered geographically. I can tell you that driving 90 minutes one-way to do an in-person event begins to wear on a person in a pretty short time, especially if you’re driving north, south, east and then west in a given month. If one of your business-builders happens to live in Texas and you live in Minnesota, you have to use technology to stay in touch and be a true leader for your distant teammate. What’s a good way to use technology to build and sustain your business? Some of your folks have kids and jobs and aging parents to care for and TV to watch and gardening to do and really, 10,000 things that make life a pleasure to live. Heck, you might have all those things, too. I wonder how you keep people interested in Young Living and help them find the time and mental energy to stay on track for a healthier, happier life? So, I’m not questioning the heart-centered sharing model of in-person events that are easily duplicated by anyone willing to learn the method. But I do think some of these other questions can be answered by momentum marketing, and that heart-centered sharing can be greatly enhanced by following a simple and duplicatable four-step process each and every time. That may not sound like a revelation to most of you. You already know that part. Now, if you had practical examples of how to use the four-step process in activities you actually do in your business, wouldn’t that be helpful? Like, how to use the four-step process to talk about the monthly promotions, the free stuff people can get if they buy certain PV levels. Why is it important to get free products? What good do the free products do a person? How can people find the money to spend each month? If you could answer those questions, do you think people would be more likely to see ordering on a regular basis as a good thing? Or let’s take care calls as another example. You do care calls, right? When you follow through with people on a regular basis, not just for the first month after they enroll, but on an ongoing basis to empower and serve and keep sharing. Or maybe you’re the kind of person who thinks care calls are a bother, or you can’t think of what to talk about so you avoid doing them, or maybe you do them but they’re not as effective as you’d like them to be. Why is regular communication important? What do you talk about? How can you do a “care call” using technology other than the telephone? If you had answers to those questions, you’d do your followup and feel good about it. Here’s one more example, and this is a big one. People in Young Living communities LOVE trying on the products and LOVE following protocols that give them results. Think of the petrochemical cleanse, the five-day cleanse, NingXia Red 30-day challenges, Gary Young’s Great Day protocol, the Feelings Kit, Raindrop treatments, and dozens of others. People LOVE that stuff. I know I do. Why is it important to try on products and protocols? What is the protocol about, and what results can a person expect? How do you do the protocol? It’s not enough for YOU to do it; how can you show other people it’s a good idea? Why. What. How. Action. Four steps, used in different situations, to build excitement and passion and enthusiasm and your business. Heart-centered momentum marketing. Yep, this is a big topic. I put together some training videos for you. Look up on the menu area above this post, click on the word Seminars and drop down to Momentum Marketing to check them out.